CHANHASSEN, Minn. (March 18, 2015) — Life Time—The Healthy Way of Life CompanySM (NYSE: LTM), today announced that Gildan, a leading brand and supplier of quality t-shirts, activewear, underwear and socks for the entire family, will be the title sponsor of its premiere athletic event series for women, Esprit de She – The Spirit of Her Race Series. Since its inception in 2013, more than 25,000 women ranging in age from 5 to 80 have participated in the series with sellout registrations at multiple events. The race series, which features fitness-inspired ‘happy hour’ 5k and 10k runs, duathlons and triathlons for every pace and passion, is a perfect addition to the Gildan sponsorship portfolio allowing the company to celebrate women who have been vital to the growth of its brand. The sponsorship also allows Gildan to activate another cornerstone of its brand: corporate social responsibility. Girls on the Run, a physical-activity based, positive youth development program for girls in the 3rd – 8th grade, returns for the third year as the National Charity Partner and beneficiary of the Gildan Esprit de She race series and creates the opportunity to build the next generation of empowered women as the non-profit celebrates its milestone in serving one million girls this year. The 2015 series celebrates the theme “Happy in Numbers” and kicks off May 3 in Tempe, Az. with a duathlon and triathlon; subsequent races take place in key markets across the nation, including: Atlanta, Chicago, Dallas, Denver, Houston, Minneapolis, Raleigh and San Diego. 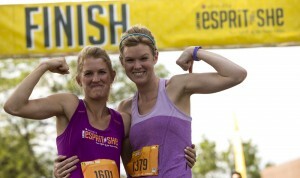 To RSVP for any of the Gildan Esprit de She events, visit www.espritdeshe.com, the official website of The Spirit of Her Race Series. Gildan Esprit de She can be found on Twitter @EspritdeShe and on the Esprit de She Facebook page. As The Healthy Way of Life CompanySM, Life Time Fitness (NYSE:LTM) helps organizations, communities and individuals achieve their total health objectives, athletic aspirations and fitness goals by engaging in their areas of interest — or discovering new passions — both inside and outside of Life Time’s distinctive and large sports, professional fitness, family recreation and spa destinations, most of which operate 24 hours a day, seven days a week. The Company’s healthy way of life approach enables members to achieve this by providing the best programs, people and places of uncompromising quality and value. As of March 18, 2015, the Company operates 114 centers under the LIFE TIME FITNESS® and LIFE TIME ATHLETIC® brands in the United States and Canada. Additional information about Life Time centers, programs and services is available at lifetimefitness.com.